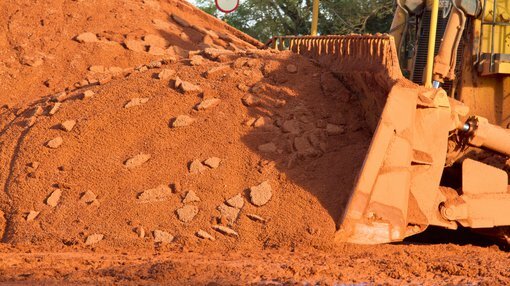 Hardey Resources (ASX:HDY) has revealed preliminary findings from its pre-acquisition due diligence on Vanadium Mining’s (VanMin) four Queensland projects — Sharptooth, Spike, Cera and Petrie. Encouragingly, these findings confirm that all four projects are situated within an enriched vanadium mineralised zone, with considerable exploration upside. They also suggest potential for modelling a JORC (2012)-compliant Inferred vanadium Resource. This is a key positive at this early stage of the due diligence review, materially de-risking the four Queensland projects. Within each project area are significant occurrences of the Toolebuc Formation, which is an oil shale highly prospective for vanadium mineralisation and secondary oil-bearing potential. Common to all four projects is outcropping and below surface occurrences of the Toolebuc Formation. Notably, the Toolebuc Formation has a shallow, favourable dip and occurs from surface to 5 metres below. Typically, the Toolebuc Formation’s thickness below surface averages 12 metres but this can reach 25 metres in places. Historic surface sampling and drill-hole assay results within the region confirm this finding. Moreover, HDY’s peers, Intermin Resources (ASX:IRC) and Liontown Resources (ASX:LTR), have confirmed Resources along strike that align with the Sharptooth Project and within the Toolebuc Formation. Notably, illustrating the extent of mineralisation, IRC has reported a JORC (2012)-compliant total resource for its Richmond Project of 2,579Mt at 0.32% vanadium oxide (0.29% cut-off), while LTR has announced a maiden Inferred Resource of 83.7Mt at 0.30% vanadium oxide (0.29% cut-off). The Sharptooth Project has five historical drill-holes with vanadium oxide assay values up to 0.32% — this exceeds LTR’s average grade but is in line with IRC’s reading. There are some 170 air-core drill-holes, averaging 30 metres in depth, across the north-south trending Spike, Cera and Petrie Projects (completed in 2010), which have a combined 150 kilometre strike length, with widespread elevated vanadium oxide assay results. Importantly, the Cera Project has numerous intercepts exhibiting elevated assay results up to 0.58% vanadium oxide. 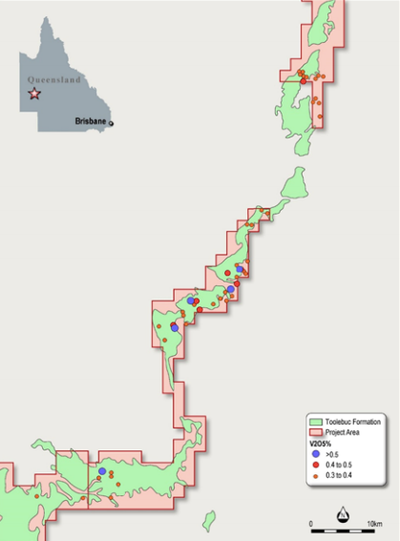 Having assessed these Queensland projects holistically, HDY’s geology team believes there is adequate historic drilling and sampling data to potentially geologically model a JORC (2012)-compliant Inferred Resource. This brings HDY one step closer to its aim to emerge as a vanadium supplier to the renewable energy sector. Moving forward, HDY’s focus will be expanding the area of historic drill-hole interpretation to extrapolate the data across the projects, which have a strike length of 150 kilometres, with the aim of defining an exploration target. HDY will complete further work to ascertain if a JORC-compliant Resource can be determined from historic data — the company will then progress due diligence on its Northern Territory assets. HDY Executive Chairman, Terence Clee, said that these early due diligence findings are “highly encouraging” — especially the confirmed prevalence of the Toolebuc Formation across the projects. 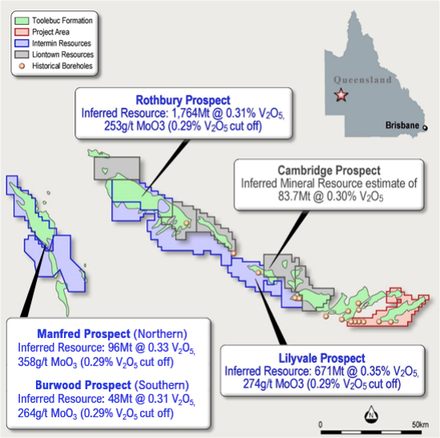 “More significantly, the Board is delighted with the prospect of being able to model a JORC compliant inferred vanadium pentoxide resource, as this materially de-risks this Queensland projects,” said Clee.